Chief Executive Of? cer. Hume has been But Hume, having seen his fair share there working – and we believe in the in North America that promise to drive with the company since 1992, and on a of marine cycles, neither gets too ex- need for a strong inland shipping busi- growth forward fast. Fla., he discussed the challenges and op- portunities that lie ahead for his company. ŽIÐ?ŽE?Ðl???G?|sÐG?AYE?Žu?OŽY?lŽUGGÐŽ??ÐusGYl?wŽ|sYOIŽ??A?E? invest with the long term, big picture in mind. W&O is well on its way to hitting its growth target, no small feat in the face of a historically tight maritime market. When asked “how,” Hume was succinct: acquisitions. “We are looking at two or three ac- quisitions as we speak. To get to a $250 million company it will be about ? nding the right acquisitions, domestic or inter- national.” Through PON, W&O has the resources and the wherewithal to move quickly when opportunity arises to “in- vest ahead of the trend. PON has a ‘buy and hold’ strategy; they don’t do any- thing temporarily just because it might look good,” said Hume. 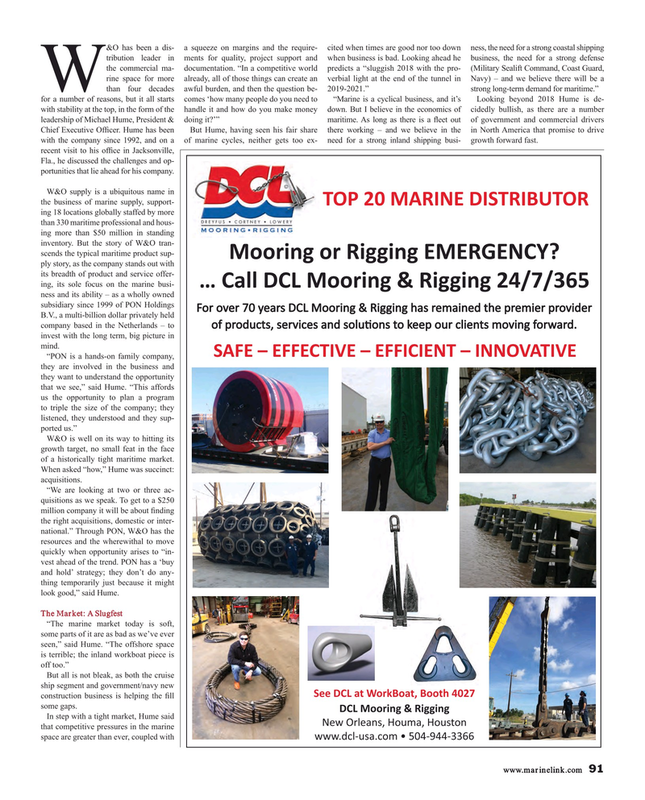 See DCL at WorkBoat, Booth 4027 construction business is helping the ? ll some gaps. EG?K?uGAY??,Ž?wA?,Ž? ?lŽY that competitive pressures in the marine space are greater than ever, coupled with ????EÐu???A?ÐŽw???????????? ?